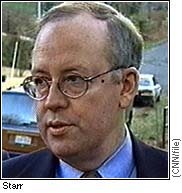 WASHINGTON (April 1) -- A new government report estimates that Independent Counsel Ken Starr's investigation spent nearly $4 million in the six month period that ended September 30, 1997. That brought the three-year price tag of his investigation to just shy of $30 million. The General Accounting Office report to Congress is required every six months. The latest filing does not include any costs of the Monica Lewinsky investigation, which began in January 1998. Starr's report to the GAO listed $1.5 million in personnel costs and benefits for the six-month reporting period. It also listed nearly $800,000 in travel expenses. And it estimated his office received $486,000 worth of help from the FBI from April through September last year, and an additional $67,000 worth of assistance from the Internal Revenue Service. Starr's costs are expected to rise in the next filing period; he requested and received additional FBI help for the Lewinsky investigation. President Bill Clinton's supporters have criticized Starr's spending. The report also offered a summary of the costs incurred by five other independent counsel investigations. Arlin Adams/Larry Thompson, for a Housing and Urban Development investigation dating back to March 1990 (Bush administration): $532,360. David M. Barrett, for an investigation of former Clinton House Secretary Henry Cisneros: $1.6 million. Barrett's total surpassed $5.4 million. Daniel S. Pearson, for an investigation into Commerce Secretary Ron Brown. (This investigation was closed after Brown's April 1996 death and transferred back to the Department of Justice): $10,372. Donald C. Smaltz, for an investigation of former Clinton Agriculture Secretary Mike Espy: $2.9 million. His total is now more than $15 million. Curtis E. Von Kann, who investigated whether former AmeriCorps director Eli Segal violated conflict of interest laws. (Van Kann declined to pursue any charges): $196,038. Total spending reached nearly $245,000.